From left to right: Dr. Dave Magee, Vice President of Research at UNB and BioNB Board Member; Meaghan Seagrave, Executive Director at BioNB, Dr. Diane Botelho, New Brunswick Bioscience Achievement Award Winner; Krista Han, Partner at Grant Thornton, and Jamey Smith, Executive Director at The Huntsman Marine Science Centre and BioNB Board Member. 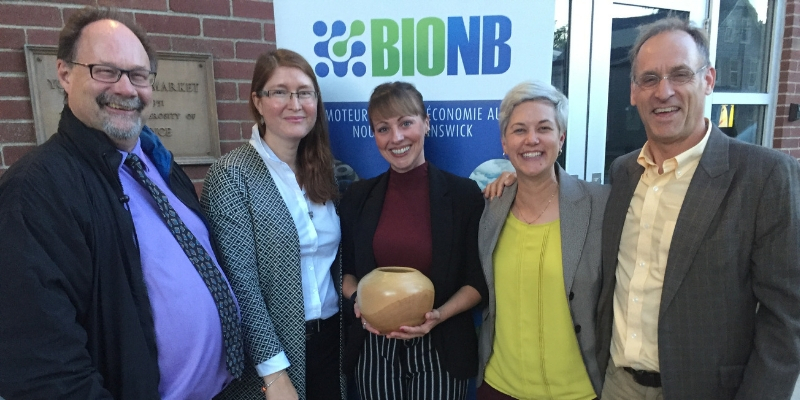 Fredericton, New Brunswick (September 28, 2018) – BioNB, New Brunswick’s bioscience agency, awarded Dr. Diane Botelho the New Brunswick Bioscience Achievement Award on Thursday September 27th at the annual industry event, Innovation at the Market. Over 100 members of the business and research community gathered for the presentation of the award and the celebration of the substantial growth experienced by the province’s bioscience sector in recent years. Dr. Diane Botelho has been spearheading the Air Quality Department at the Research and Productivity Council for over 7 years. Her expertise and her work are not limited to testing for mold, radon or asbestos. Her work has had implications in a number of New Brunswick’s traditional industries and is now leading the way in air quality and air testing in the country’s growing cannabis sector. She is actively involved in the research community in New Brunswick and contributes to the next generation of researchers in her role as adjunct professor at UNB where she oversees senior student projects and mentors graduate students. Dr. Botelho is one to watch in the coming years as air quality plays an important role in shaping the industries of our future including clean-tech and medical cannabis. The New Brunswick Bioscience Achievement Award is bestowed every year to an individual, company or research team, in recognition of their outstanding contributions to the growth and promotion of the sector and whose contributions have helped to put New Brunswick on a national or global stage. Among the long list of previous winners are ADI Systems, Sylvar Technologies, LaForge Bioenvironmental and LuminUltra Technologies. This year’s award was presented at Innovation at the Market, the bioscience community’s flagship networking event and celebration of Global Biotechnology Week (September 24 – 30). Dr. Botelho was chosen from among four strong nominees this year: Dr. Bethany Deshpande, CEO of the dairy technology company SomaDetect; Natasha Dhayagude, CEO of Chinova Bioworks, the manufacturer of a clean label preservative for the food and beverage industry; and Paul Gunn, President and CEO of Soricimed Biopharma, a drug and diagnostic development company. Grant Thornton, sponsored the BioScience Achievement Award, which was presented by Krista Han, a partner at Grant Thornton. BioNB hosted Innovation at the Market with the support of the following sponsors: LuminUltra Technologies, Grant Thornton, CIBC Wood Gundy – Mais Reynolds Financial Group, Ignite Fredericton and the New Brunswick Innovation Foundation.